Purpose: The aim of this study was to assess the final visual outcome and various complications, encountered in the posterior iris-claw intraocular lens (IOL) implantation in aphakic eyes with inadequate capsular support. Methodology: Prospective case series of 30 eyes of 29 patients who underwent posterior iris-claw intraocular lens implantation in a tertiary care center within 1 year (January 2016 to June 2017) with a follow-up period of 6 months. All patients with visually significant posterior segment problems were excluded from the study. Main outcome measures were visual acuity, anterior chamber reaction, corneal edema, the stability of IOL, and cystoid macular edema (CME) at 6 months. Results: Of the 30 eyes enrolled in the study, 24 (86.7%) eyes were taken for elective secondary implantation. Four (13.3%) eyes were for primary iris-claw implantation, where subluxated or dislocated lens was noticed preoperatively. The indications for posterior iris-claw IOL in our study were surgical aphakia (24/30), traumatic subluxation of the cataractous lens (2/30), dislocated lens (2/30), and decentered posterior chamber IOL (2/30). Postoperative mean best-corrected visual acuity (BCVA) was LogMAR 0.3. 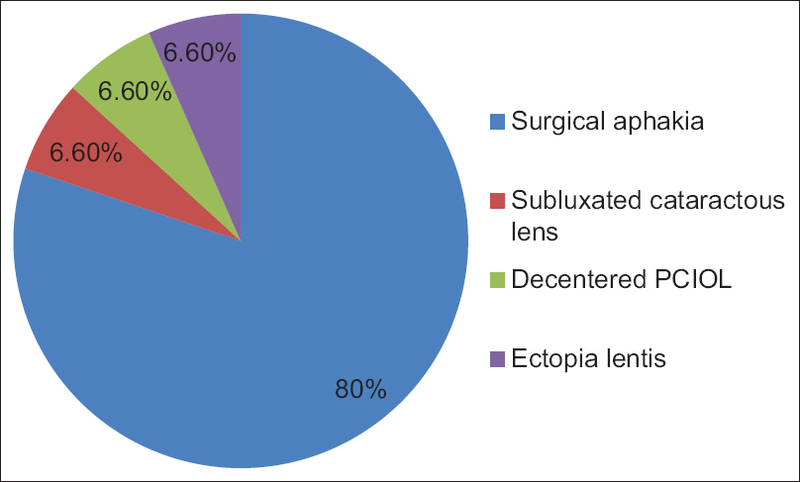 Analysis of complications showed that the most common postoperative complications were iritis (36%), corneal edema (30%), striate keratitis (26.6%), hyphema (6.66%), iris capture (6.66%), and CME (3.33%). Conclusion: Surgical aphakia is the most common indication for posterior iris-claw IOL implantation. Postoperative mean BCVA is comparable with other methods. Iritis is the most common complication. This technique is a relatively safe and easy procedure learned by postgraduate students. Planned extracapsular cataract extraction with posterior chamber intraocular lens (PCIOL) implantation in the capsular bag is the “gold standard” procedure for managing cataract. However, after a complicated cataract surgery, there may be insufficient remaining capsular support for either an 'in the bag' or posterior chamber sulcus placement of the intraocular lens (IOL). In such cases, different techniques are required for IOL fixation. These techniques include sutured or suture-less scleral fixation, angle-supported anterior chamber IOL implantation, and iris fixation. The surgical procedure of an angle-supported anterior chamber IOL is safe and fast, but complications are more. Scleral fixated IOL (SFIOLs) is a preferred option for many surgeons, but the technique is more challenging, surgical time required is more, and it has a longer learning curve. Furthermore, the stability of SFIOLs can be jeopardized due to degradation of suture material over time, leading to dislocation of IOL. In 1972, Worst et al. presented the first iris-claw lens. Here, lens is fixated to the mid-peripheral iris, where the iris is less vascularized and less reactive. The technique for implantation of iris-claw lens is easy. On the posterior surface of the iris, it combines the benefits of posterior chamber implants with a low-risk method of surgery. Retro pupillary fixation of iris-claw lens enhances stability, prevents tilting of the lens and reduces the glare phenomenon,, Posterior iris-claw lenses avoid the corneal complications of an anterior chamber IOL and the surgical challenge of a sutured PCIOL. Therefore the purpose of the study was to evaluate the final visual outcome and the complications of Posterior Iris Claw Lens implantation in aphakic eye with inadequate capsular support at 6 months after surgery. This prospective study included patients with surgical aphakia with poor capsular support at our tertiary eye care center from January 2016 to June 2017. The Ethical Committee approval was taken before the start of the study. Primary iris-claw implantation where subluxation or dislocation of the lens was noticed preoperatively due to zonular dehiscence. The sample size was calculated using the formula n = 4pq/d 2, with the power of 80% calculated sample size was 25, and it was decided to take 30 cases. Patient with surgical aphakia after undergoing manual small incision cataract surgery. Patient with aphakia due to any causes other than surgery. Those with pre-existing posterior segment pathologies compromising vision. All the surgical aphakic patients after small incision cataract surgery attending ophthalmology outpatient department and those undergoing posterior iris-claw implantation were selected for the study purpose. Preoperatively, all patients underwent complete ophthalmologic evaluation, Including. Best-corrected visual acuity (BCVA), slit lamp examination, intraocular pressure (IOP), fundus examination, keratometry, A scan biometry. A single surgeon, after a written informed consent, operated all cases. All cases were done under the peribulbar block. The lens used in our study was Excelens (Excel Optics Pvt. Ltd., Chennai, India) polymethyl methacrylate single-piece biconvex iris-claw IOL with a total length of 8 mm and 5.5 mm optic size. The recommended a constant by the manufacturer was 117.2. We preferred the SRK-T formula for achieving postoperative emmetropia. In elective secondary implantation, a 5.5 mm scleral tunnel was made or revised using a crescent knife. Two paracenteses were made at 3 and 9 o'clock position and pilocarpine (0.5%) was injected intracamerally. The anterior chamber was entered after injecting viscoelastic material. Posterior iris-fixated IOL was implanted using an iris-claw IOL holding forceps and Sinskey hook and enclaved on the posterior surface of the iris mid peripherally at 3 and 9 o'clock meridian. Peripheral iridectomy was done at 11 or 1 o'clock position. Viscoelastic material was removed. A suture was placed to seal the wound. Subconjunctival injection of antibiotic was given. Postoperatively, the topical steroid-antibiotic regimen was followed. The postoperative assessment was done by a single observer on day 1, day 7, day 14, 1 month and 6 months. Main outcome measures were visual acuity, and complications such as anterior chamber reaction, corneal edema, hyphema, hypotony, the stability of IOL, cystoid macular edema (CME), and retinal detachment. Data were analyzed using Microsoft Excel. Total, 30 eyes of 29 patients were enrolled in our study, 18 were male, and 11 were female, the majority came under the age group 50–70 years. Out of 30 eyes, 26 (86.7%) eyes were for elective secondary implantation, and 4 (13.3%) eyes were for primary iris-claw implantation. The commonest indication for Posterior Iris Claw IOL implantation in our study was surgical aphakia [Figure 1]. Posterior Iris Claw IOL were implanted in 4 eyes in the primary procedure it self, where subluxated (>180°) or dislocated lens was identified during preoperative work up. These, two eyes had subluxation of cataractous lens due to pseudoexfoliation. One patient had bilateral ectopia lentis where in the right eye the lens was dislocated in to the anterior chamber and in the left eye to the anterior vitreous. In secondary IOL implantation group, average preoperative BCVA with aphakic correction was Log MAR 0.40 ± 0.18 The average postoperative BCVA at 6 months was Log MAR 0.262 ± 0.22 (p = 0.001) Details of preoperative and postoperative visual acuity of all patients are given in [Table 1]. 22 out of 26 patients (84.6%) had post operative BCVA better than mean preoperative BCVA with aphakic correction [Table 2]. In primary iris-claw IOL implantation, preoperative BCVA was Log MAR 0.8 in one patient and 1 meter counting finger for the second one. Both the patients had a postoperative BCVA better than Log MAR 0.3. Other two cases included in the primary IOL implantation group were a patient with spontaneous subluxation of the lens in both eyes. His pre-operative vision in the right eye was 1 m counting finger and other eye with aphakic correction Log MAR 0.6. Postoperatively, his BCVA was Log MAR 0.5 and 0.6, respectively. Analysis of postoperative refractive correction [Figure 2] showed that 18 eyes (60%) had a cylindrical correction ranging between −1.5 D and +1.75 D cylinder. Thirteen eyes (43.3%) had spherical correction ranging from −1.25 to +1 D sphere. 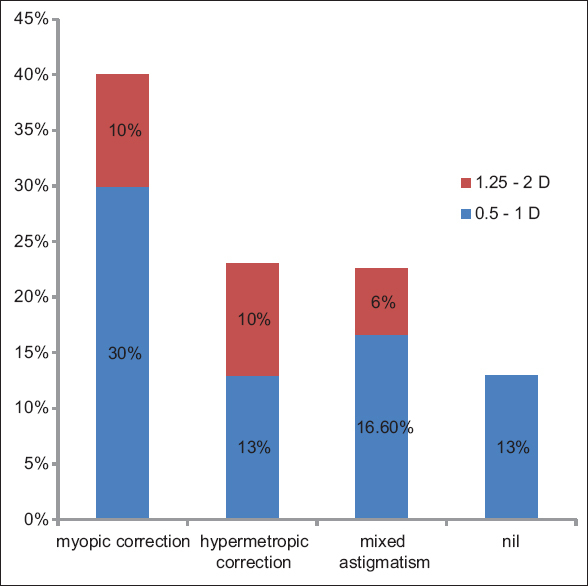 Among these 40% of eyes had myopic correction, 23% had hypermetropic correction, and 22.6% showed mixed astigmatism. Nearly 13% were not accepting any glass correction. Analysis of complications showed that the common postoperative complications were iritis (36%), corneal edema (30%), striate keratitis (26.6%), ovalization of the pupil (26.6%), hyphema (6.66%), iris capture (6.66%), and CME (3.33%). IOP – Pre-operative IOP ranges between 8 and 18 mm Hg. Moreover, postoperative IOP was measured in each patient on every follow-up visits. It ranges between 10 and 24 mm Hg. One patient had an IOP value of 24 mm Hg at 1 month follow-up. He was started on timolol maleate eye drops and continued for 4 months and then stopped. Optical rehabilitation of aphakia after manual small incision cataract surgery is a challenge for the surgeon as the expectation of a patient after cataract surgery is a good visual outcome. Retropupillary iris-claw implantation is a relatively new procedure for correction of aphakia, where it can be placed at the time of primary procedure or as a secondary procedure after an interval, in complications like posterior capsular rupture and subluxated lens. Good visual outcome and less postoperative complications are desirable in this procedure. The rationale behind preferring posterior iris-claw IOL over anterior one is that posterior iris fixated IOL is retro pupillary and has a lesser risk of endothelial decompensation, as described by Jare et al's. study. Posterior iris-claw lens also has the advantage of being a simple procedure, with the positioning of the lens near the nodal point and there is no need for extra sutures or glue. Our study results were comparable to other studies of posterior iris-claw IOL implantation with good visual outcome and low complications. All our patients had completed the 6 months follow-up period. Average BCVA on Log MAR was 0.3 comparable to many other studies., In a retrospective case series by Gonnermann et al., posterior iris-claw aphakic implantation was done in eyes without adequate capsular support. They reported a good visual outcome with a favorable complication rate in terms of CME (8.7%), hyphema (2.1%), and elevated IOP (4.3%). The most common postoperative complication in our study was iritis, in 11 patients in the first 2 weeks of surgery. None of them had chronic anterior chamber inflammation, similar to a study by Jare et al. IOP in our study population was within 8–18 mm Hg preoperatively. One patient showed postoperative IOP value of 24, and he was started on Timolol maleate eye drops and continued for 4 months, it could be attributed to an increased response to steroids. Güell et al. reported three eyes with steroid-induced increase in IOP. Similarly, Schallenberg et al. Observed raised IOP in one out of 31 patients. Two (6.6%) of our patients had hyphema, which resolved with time. One patient (3.3%) had CME, which compromised his BCVA similar to a study by Forlini et al. At the end of 6 months follow-up, we could see pupillary capture in two patients who otherwise normal. None of our patients had IOL instability or retinal detachment. Shortcomings of our study lie in the limited number of patients, and short follow-up period. The 6 months results of this prospective study with adequate sample size and objective evaluation of visual acuity and postoperative evaluation validate the role of posterior iris-fixated lenses in aphakic patients, in the absence of adequate capsular support. According to our study surgical aphakia is the most common indication for posterior iris-claw IOL implantation. Postoperative mean BCVA is comparable to all other IOL surgeries. Iritis is the most common complication, which is not interfering with the final visual outcome. This is a relatively safe and easy procedure, which can also be learned by post-graduate students during their training period. Worst JG. Iris claw lens. J Am Intraocul Implant Soc 1980;6:166-7. Helvaci S, Demirduzen S, Oksuz H. Iris-claw intraocular lens implantation: Anterior chamber versus retropupillary implantation. Indian J Ophthalmol 2016;64:45-9. Schallenberg M, Dekowski D, Hahn A, Laube T, Steuhl KP, Meller D, et al. Aphakia correction with retropupillary fixated iris-claw lens (Artisan) – long-term results. Clin Ophthalmol 2014;8:137-41. Jare NM, Kesari AG, Gadkari SS, Deshpande MD. The posterior iris-claw lens outcome study: 6-month follow-up. Indian J Ophthalmol 2016;64:878-83. Rao R, Sasidharan A. Iris claw intraocular lens: A viable option in monocular surgical aphakia. Indian J Ophthalmol 2013;61:74-5. Gonnermann J, Klamann MK, Maier AK, Rjasanow J, Joussen AM, Bertelmann E, et al. Visual outcome and complications after posterior iris-claw aphakic intraocular lens implantation. J Cataract Refract Surg 2012;38:2139-43. Güell JL, Verdaguer P, Elies D, Gris O, Manero F, Mateu-Figueras G, et al. Secondary iris-claw anterior chamber lens implantation in patients with aphakia without capsular support. Br J Ophthalmol 2014;98:658-63. Forlini M, Soliman W, Bratu A, Rossini P, Cavallini GM, Forlini C, et al. Long-term follow-up of retropupillary iris-claw intraocular lens implantation: A retrospective analysis. BMC Ophthalmol 2015;15:143.